Why did we get so much more snow than forecast? The snowfall totals exceeded expectations. 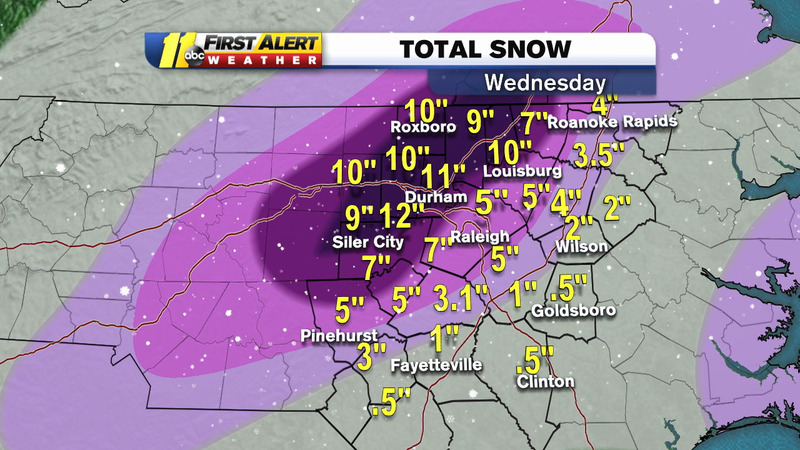 DURHAM, NC (WTVD) -- Before the snow began Wednesday morning, we predicted accumulations of 3 to 5 inches in a band from the Triangle to the northwest toward Roxboro. By the time the snow ended late Wednesday night, some areas had more than double that amount! So what happened that we ended up with so much more snow than forecast? It all comes down to something called the "liquid equivalent." By that, I mean "how much will fall if everything is rain?" On Wednesday, all of the reliable computer models were forecasting between .20 inches and .50 inches amount of "liquid equivalent" would fall over the region of heaviest snow. Typically, at 32 degrees, 1 inch of rain will produce 10 inches of snow. So using the 10:1 ratio for snow to rain, it appeared between 2 and 5 inches of snow across the region. How the snow affects the temperatures. Chris Hohmann explains. If you look at RDU Airport, that worked out pretty well. If you melted the 5.9 inches of snow that fell, it would amount to about one half inch of rain. But the heavy snow bands that developed over Durham and points to the north stalled for several hours in the morning before moving into Wake County. So the "liquid equivalent" was closer to an inch of rain in the areas with the heaviest snow. None of our computer models showed any signs of that much precipitation falling. Pinpointing small-scale features like where heavy snow bands will set up and how fast they move is very difficult, as Wednesday proved!